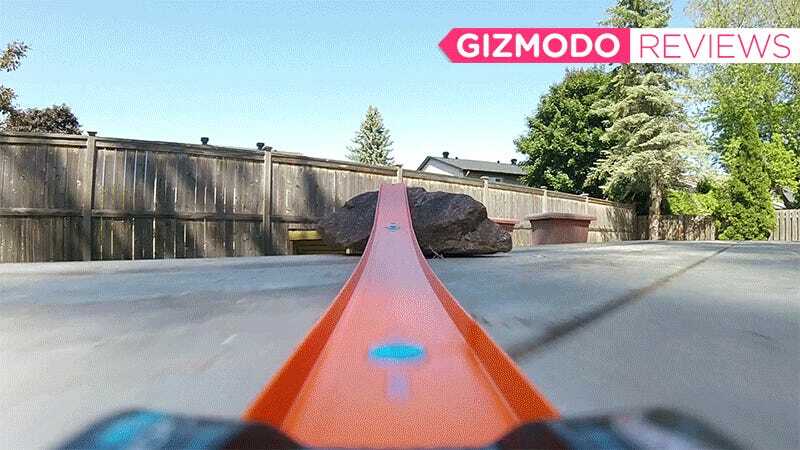 Watching a race from the sidelines is never as fun as being in the driver’s seat, and with that obvious wisdom in mind, Mattel has partnered with GoPro to create a new camera-compatible Hot Wheels car that lets kids and grownups experience what it’s like to careen down those iconic orange plastic tracks. It’s also the only chance you’ll probably ever have to race through a vertical loop without destroying your car. 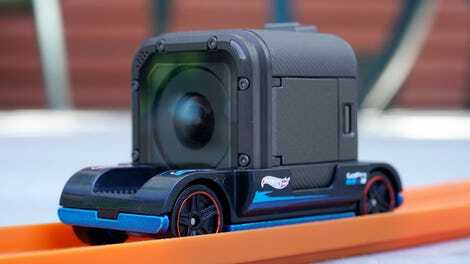 A GoPro-compatible Hot Wheels car that lets you record your amazing stunts. $1.09 for the Hot Wheels car, plus at least $150 for the GoPro camera. The safest way to live out your stunt driver fantasies. Not compatible with all Hot Wheels stunt sets. Hot Wheels fans are probably feeling a bit of déjà vu, because back in 2011, Mattel released a similar toy car with a tiny built-in camera. However, the Hot Wheels Video Racers could only capture video at 640x480-pixel resolutions (at 30 FPS), or at 320x240-pixels with the frame rate doubled to 60 FPS. Even by 2011's standards, that was some lousy image quality, so the toy quickly found its way into discount bins, and the idea was seemingly abandoned. But over the years video cameras continued to shrink, while the quality of tiny image sensors vastly improved, and in 2015 GoPro’s Hero4 Session arrived. It was a tiny cube camera that could capture video at full HD resolutions (and is now 4K-capable) but more importantly, it was soon discovered to be small enough to strap to a Hot Wheels car. Miniature racing enthusiasts starting modding Hot Wheels toys to accommodate the camera, even going so far as to design custom 3D-printed vehicles that were compatible with Hot Wheels tracks. The Hot Wheels Zoom In is more about functionality than a sleek design. Translation: It’s kind of ugly, but it works. Inspired by these homebrew alternatives, Mattel has finally created an official GoPro-compatible car with its new Zoom In toy. As Hot Wheels cars go, collectors who focus on curvy lines and sleek designs aren’t going to be racing to add this one to their tiny garages. The Hot Wheels Zoom In is instead all about functionality. It’s really nothing more than a tiny four-wheeled sled designed to hold a GoPro Session camera as low to the ground as possible to minimize rollovers—but they still frequently happen. A small plastic clip holds the GoPro Session camera in place, and it only popped out after a severe, head-on collision. The GoPro is held in place using a small pop-up plastic clip that flexes just enough to let you securely jam the camera in there. During all of my testing, 50 or 60 runs, I only had the camera pop out of the Zoom In car once, after a high-speed, head-on collision with a rock that wasn’t going to budge. Catastrophic accidents like that can happen, but the simple clip works so well that it’s a rare occurrence. The length of the Zoom In car means the front end (with blurry GoPro and Hot Wheels logos) will always be a part of your videos and photos. 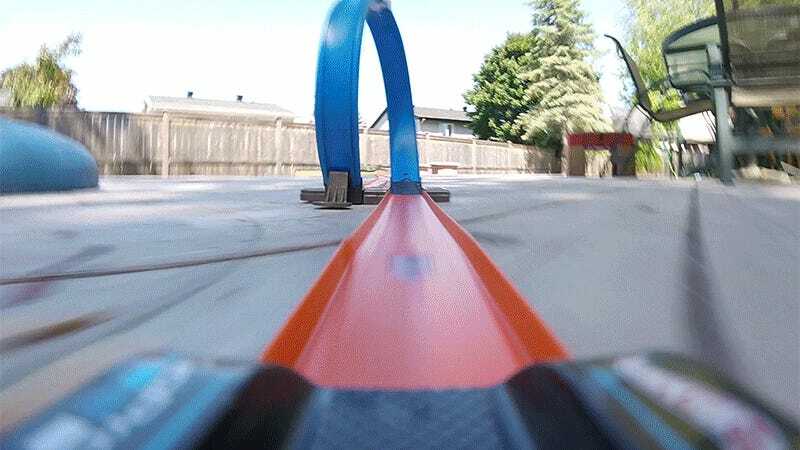 The Zoom In is the same width as the average Hot Wheels car so that it’s compatible with the line’s orange track pieces, but it’s a little longer, a little taller with the GoPro attached, and considerably heavier. The average Hot Wheels car weighs in at around 32-grams, where as the Hot Wheel Zoom In carrying a GoPro tips the scales at 110-grams. So while it works just fine with Hot Wheels tracks, it might not work perfectly with some of the line’s playsets, or more extreme track layouts. Trial-and-error is the name of the game for getting the perfect run with the Hot Wheels Zoom In. 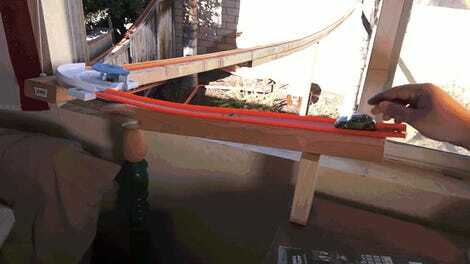 Vertical loops were an especially challenging stunt. For example, getting the Zoom In car to successfully traverse a vertical loop took a lot of speed, and about 30 attempts to finally get the perfect run. The rig also has problems with rolling over in tighter corners if it’s coming in too fast. I found the standard (and lighter) Hot Wheels cars to be far more forgiving with my outlandish stunt driving demands. There’s no definitive list as to which Hot Wheels playsets and track designs the Zoom In will or won’t work with, so expect a bit of trial-and-error before you nail the perfect run. For adults the experimentation is all part of the fun, but kids might get bored sooner than their parents do. Both the camera and car are (mostly) waterproof, so you can have a lot of fun with a pool. Being able to ride along as you send a Hot Wheels car careening through a crash course no human driver would ever survive is a lot of fun. You’ll find yourself experimenting with sadistic layouts and courses, and repeatedly heading back to the toy store to buy more and more track pieces. It’s incredibly satisfying to finally be able to sit in the driver’s seat of a tiny car, but I do wish reviewing the footage was a little more immediate. Unlike larger GoPro cameras, the tiny Session doesn’t have an LCD display for reviewing footage.. You don’t necessarily have to keep popping out the microSD card and sticking it into your laptop to watch each run, it can also wirelessly connect to a mobile app over wifi. But the 10-year-old inside me found the few seconds it took to cache and stream each video excruciatingly long. A minor quibble, for sure, but I suspect actual kids might be equally impatient. 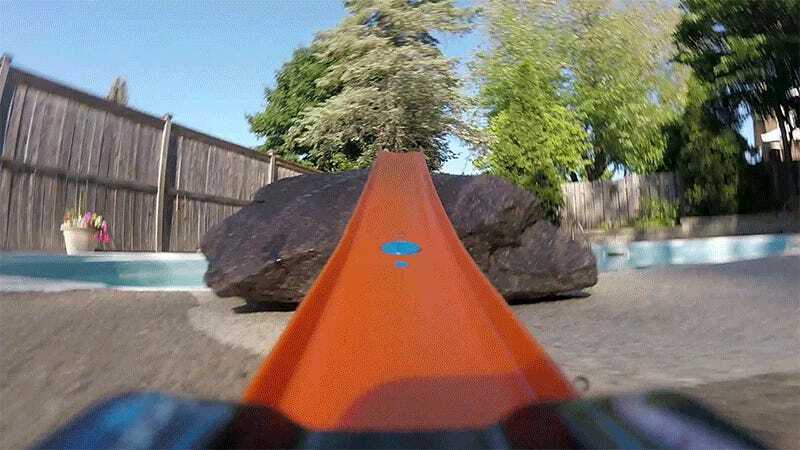 If you’ve already got the requisite GoPro, at $1.09 the Hot Wheels Zoom In is a no-brainer accessory. If your camera kit already includes any of the tiny GoPro Session cameras, and you have even the mildest interest of having some extra fun with it, the Hot Wheels Zoom In is a must-have accessory at $1.09. It’s an impulse purchase that’s going to deliver a lot of fun and replay value, even if it takes you 30 runs to get the camera car all the way through a course you’ve designed—and repeatedly redesigned. 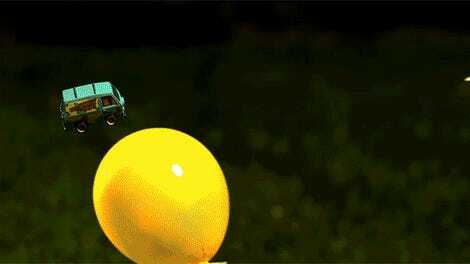 The resulting videos will satisfy the stunt driving fantasies the police and insurance companies won’t permit. At $1.09 the toy Hot Wheels car is dirt cheap, but it requires a GoPro Session camera and that will cost you at least $150 more. Kids might be disappointed at the GoPro Session’s lack of a built-in LCD screen for instantly viewing the race results, but streaming to a smartphone app is a decent workaround. With the GoPro attached the Hot Wheels Zoom In car is quite a bit heavier and taller than standard Hot Wheels cars, making it prone to rolling over and crashes, and incompatible with certain playsets. The car’s camera clip is easy to use and holds the GoPro securely. Only the worst crashes will dislodge it. The length of the Zoom In car means you’ll always see the front of it at the bottom of your videos unless you do some heavy cropping.